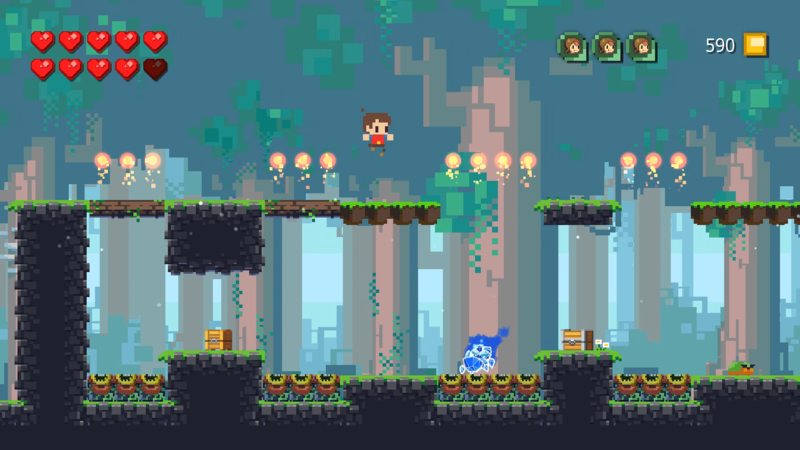 Adventures of Pip is everything you ever wanted from the retro days of side-scrolling platformers with a new age feel. Tic Toc Games, the developers behind AoP, have created a lovely game with a rich experience that’s not just “jump and evade till you reach the end of the level” gameplay. Your character/hero’s name is Pip, and he’s got a special ability: He can harness the bit-stream and change from 1-bit (Pixel Pip), to 8-bit Pip, to 16-bit Pip. Each version of Pip comes with it’s own pros and cons. You must utilize each version of pip as you try to save the Princess Adeline from the Evil Queen DeRezzia. Let’s start from the beginning. The King and Queen are turned into 1-bit pixels by the (presumably evil) Queen DeRezzia, as she kidnaps their daughter the Princess Adeline because of her special ability to create pixels out of “nothingness”. It’s a 32-bit (pixel) world after all, but Pip the lowly 1-bit “hero” is here to save the day. He gets asked by the King and Queen to go find a hero to save the day, but Pip will show us how he is the true hero in this story. Similar to the setup of Super Mario World, the “outerworld” view is a top down level selection screen. There are various “zones” you go through (forest, swamp, etc.) but you can always return to the starting town at any point and upgrade your abilities. In fact it’s pretty necessary over time so that you can have the best chance at success. It’s very reminiscent of Zelda II’s town setup, and the sellers/upgrade system is simplistic and easy to understand. The unique part about that upgrade system is that you have to find 3 villagers in each level (to save them and return them to town), and occasionally that villager is actually the seller you’ll get to purchase/upgrade your abilities from back in town. The level design is great, and each level even within zones have lots of variation to keep it interesting. The levels integrate puzzle solving with platforming in a easy to understand way, but an also frustrating way if you’re not very good at timing your jumps like I am. Needless to say, you might find yourself re-playing certain areas of levels over and over again. Never fear, as there are checkpoints you can trigger through each level. Usually they are right after difficult parts which is nice and as a bonus they refill your health! Can’t beat that. One thing I wasn’t expecting was that there are “legit” bosses at the end of each zone. I found myself at the end of the first zone (which was 8 levels by the way) fighting a giant 32-bit caterpillar. 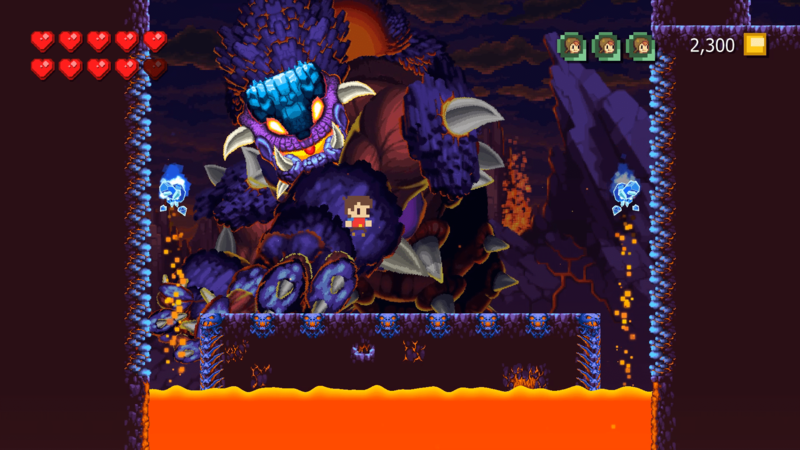 The boss rooms are the whole screen, but you’ve gotta be quick about jumping and transforming between bit-versions of Pip to successful land blows on some of the enemies. The push and pull of knowing which Pip to be, or at what moment to transform is a puzzle in and of itself, but it’s fun trying different ways to attack enemies or bosses and challenge yourself to traverse certain levels without relying on one specific role of Pip’s abilities. The thing I enjoy most about Adventures of Pip is that it’s a bit of a new take on retro platforming. What I mean by new is that it’s not solely 8-bit or 16-bit or 32-bit styling, but it’s a combination of all of those things, in a gagillion-bit era of gaming. Sometimes to make a jump or platform you have to go from 8-bit Pip to 1-bit Pip and glide your way across. Or you need 16-bit Pip’s strength to push a block out of the way, but then 1-bit pip to squeeze through the pathway you’ve revealed. AoP gracefully combines these different iterations of our gaming history together in a package that doesn’t feel disjoined or competing against itself for attention. The level design pairs nicely with the various elements of the game, and the color pallet across the various levels and areas just works well. As with most of my reviews, I tend not to go too deeply into the story because I’d rather let YOU (the gamer, viewer, listener, experiencer) have a go at the story without too much spoiled. Suffice it to say there is a story and if you’re at all a fan of Zelda or Mario games you’ll probably enjoy it too. The gameplay mechanics are smooth so you won’t be complaining about weird jump arcs or hit boxes, other than you’ll wish that 16-bit Pip could wall-jump. Overall it’s definitely worth your time. It’s got my stamp of approval, but you probably could’ve guessed that by the start of the review. 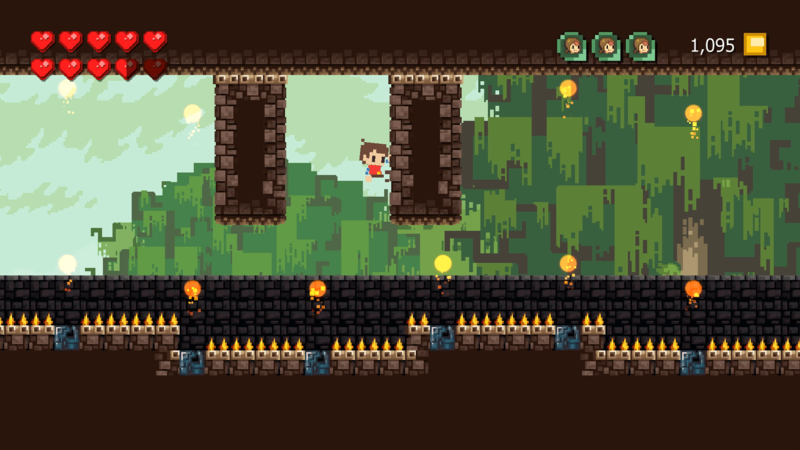 If PS4 isn’t your thing, Adventures of Pip is also available on Steam (PC/Mac), Wii U, and Xbox One. At the time this article is posted I believe all versions should be available (Steam/Wii U launched prior to PS4/Xbox One) so you’ve no excuse not to give this game a shot. After all, who else will save the Princess? Note: This review was based off my experiences on the PS4 version. Buy Adventures of Pip on Steam! PS4! Wii U! Xbox One! and even iOS Devices! Siegecraft Commander Releasing Early 2016! Ep 35 – Taken King, F2P Games, and Pax Stuff!